In part one, two, and three of this four-part series on webpack optimization we have learned various ways to slim down the payload. By reading the fourth and final part of this series, you will learn how to tie it all together using lazy loading to get your webpack size just right. We’ll start by using the so-called chunking process to split the bundle up into multiple chunk files, which enables browsers to do very effective caching. We will put all libraries into a vendor chunk and then separate it from the business logic. Because library updates are not as common as changes to your app’s code, they only need to redownload the chunk that contains your actual app. The libraries will stay cached on their machine until you purposefully update them. Afterwards, we’ll split up your app code into multiple chunks and then set up your app to only transmit code that is relevant to the current route where the user is looking. Code related to other routes will be loaded later, and only when the user needs the code. This principle is called lazy loading and the webpack docs have a wonderful guide about lazy loading right here. Webpack recommends a maximum chunk size of 250kb to avoid long running parsing of your code. This is especially important on low-end devices and is easily achievable with chunking and lazy loading. Note: I want to thank John Tucker for his excellent medium article about the webpack commons chunk plugin because my code snippets are based on his article. 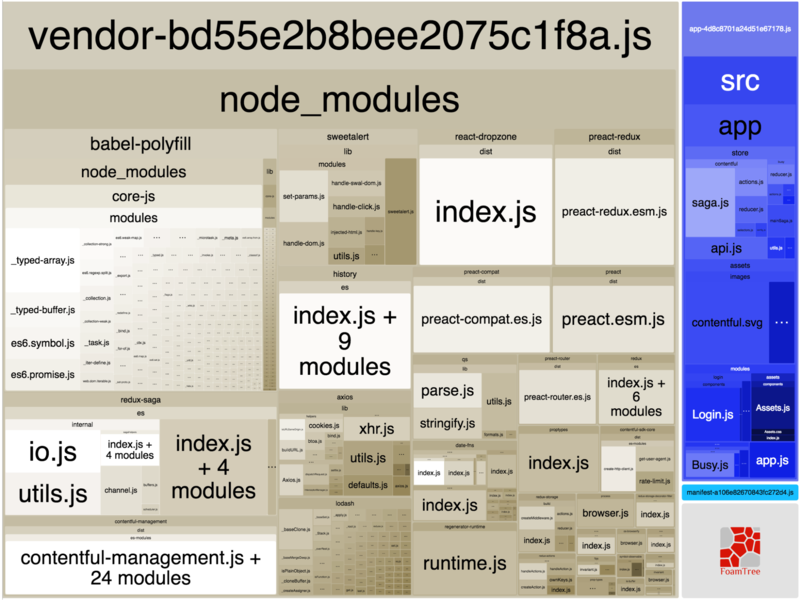 The code above creates a vendor chunk that includes all of your dependencies out of the node_modules folder. This is preferred over manually creating the vendor chunk since it ensures you do not leave out any required dependencies. Another chunk called manifest will also be created. This specific chunk contains the loader logic for the webpack chunks. Make sure to include the manifest as the first chunk in your HTML, followed by the other script tags. In bigger applications, you might have code that is only needed for some parts of your app. Code that some users might never execute — or at least not right away. It is often a good idea to split these parts apart of your main bundle, to reduce the initial payload of your app. But one more step is missing — we need to tell webpack where to split the code. This is done by doing dynamic imports by using the import() syntax that in turn implements a promise interface. Preact users can use [preact-async-route] to enable dynamic routing. For Vue.js users a [solution can be found in the Vue.js docs]. Angular provides lazy loading via the [loadChildren property on routes]. As you can see the total size increased somewhat. But for the first page load we only need to load the vendor chunk, the app chunk and the manifest. The assets chunk will be loaded later when the user navigates to the assets route of our app. This means the user only has to load 79.09KB when they visit the page instead of 90.02KB (gzipped). The benefit will increase significantly when the app is more complex compared to our very simple file-upload-example app. This blog post concludes this series on webpack optimization. We have come a long way since working with the webpack-bundle-analyzer in the first post, using the loaderOptionsPlugin in part two and parsing with Moment.js in part three. But there are still ways to update assets such as images and fonts to reduce your bundle even further. I will write about this and many more tricks in a future blog post. Getting started with Contentful is easy and free. Just head over to our [sign-up page] and create your account. You will be up and running in no time with our reliable content infrastructure.